ACMP offers opportunities for ongoing learning and engagement because we want to provide change practitioners with resouces and a solid foundation to draw upon. We also believe that by growing the change management community, we can accomplish more than any one practitioner could do on their own. This month, we are going to fill you in our “why” through our monthly updates about the exciting upcoming opportunities to advance the change management discipline and profession, and grow the community. We also encourage you to share your why with us on our social media channels and by submitting your testimonial on our new website www.acmpglobal.org. ACMP was established by change professionals for change professionals. Since our inception, we have been dedicated to advancing the discipline and profession by establishing three foundational elements: The Standard for Change Management® to provide a collection of best practices for practitioners to use as an internationally accepted resource; the Qualified Education Provider™ (QEP™) Program to provide practitioners with confidence when choosing courses; and, the Certified Change Management Professional™ (CCMP™) Program to provide the profession with an internationally recognized certification that demonstrates our practitioners have the experience, training, and knowledge to lead change. Brush up on change management’s foundational teachings, explore the latest industry topics and connect with fellow practitioners at one of our three Regional Conferences in Canada, USA, and Europe this fall. Remember, if you are CCMP certified, you can earn professional development units by attending! Submit a white paper with your ideas, concepts, case studies and proven methods. The call for white papers is open through October 16th and the winning paper will be featured at Change Management 2018! 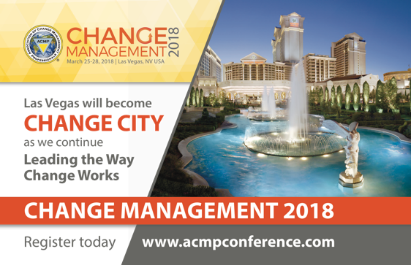 Join us in Las Vegas for Change Management 2018! Visit our fresh new conference website for the latest and greatest about ACMP conferences! ACMP is advancing the discipline of change management through this program developed for professionals, by change professionals. We are nearing the First 500 to ever hold this designation – an accomplishment that will be forever memorialized on our website! For those of you are certified, congratulations! Please remember to record your professional development units as you accumulate them through attendance at our conferences, webinars, and training sessions. To record your PDUs, log in to our website and follow the instructions provided. For those of you who are *not* currently certified, the current exam window has been extended to August 31st. You will need to complete the application and take the exam at any of our exam sites across the globe. To prepare for the exam, we encourage you to download The Standard, study our flash cards and review the Code of Ethics and Professional Conduct. For a full listing of the latest and greatest in change management educational offerings, check out our QEP Registry of more than 40 courses offered worldwide! This growing list of courses all incorporate adult learning best practices and are aligned to The Standard for Change Management. All courses will fulfill the 21-hour training requirement for the CCMP and count towards ongoing professional development units. Check out our growing QEP Registry today! We are now offering two webinars a month to ensure we are providing educational opportunities for change professionals at different points in their career. For a full listing of upcoming webinars, check out the new events section on our website. 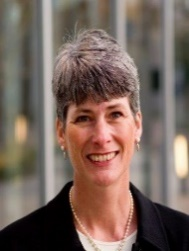 September 12 – Jennifer Witter & Marica Strom, “The Times They Are A Changin’ – Lifts and Shifts to Optimize Your Multigenerational Workforce.” Jennifer and Marica will help us understand cultural gaps that exist between the Aging Workforce and Organizations, as well as cultural gaps that exist between the Millenials and Organizations. You will walk away with content, tools and materials that can be used immediately in the workplace. Skill Level: *Beginner* (0-3 Years of Change Management Experience) Register today! September 28 – Robby Riggs, “Leading Change in the Chaotic, 4-Generation Workplace (It's Not Your Millennials Fault! )” In this webinar, Robby presents the critical issues that leaders currently face when trying to lead change in today's workplace (hint: it's not the same workplace Kotter wrote "Leading Change" for! ), and offers specific, proven solutions to leading in the new, technology-infected and Millennial overwhelmed workplace. Skill level: *Intermediate* (3-5 Years of Change Management Experience). Register today! As a ACMP Regional Conference sponsor, your organization has three opportunities to speak to targeted audiences within the change management industry. From various sponsorship levels, exhibit booth options and more, sponsorship packages can be customized to suit your brand’s needs. By supporting Regional Conference Canada, USA and/or Europe, your organization can showcase its brand to the change community and help support the growth of the overall profession. Just a few weeks remain until Regional Conference – Canada! Remember, registration is still open online and will be available on site. We look forward to two days of powerful presentations, impressive professional education and numerous networking opportunities. We look forward to seeing you in Vancouver! 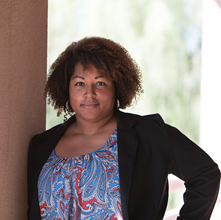 Announcing the keynote speaker for Regional Conference – USA! 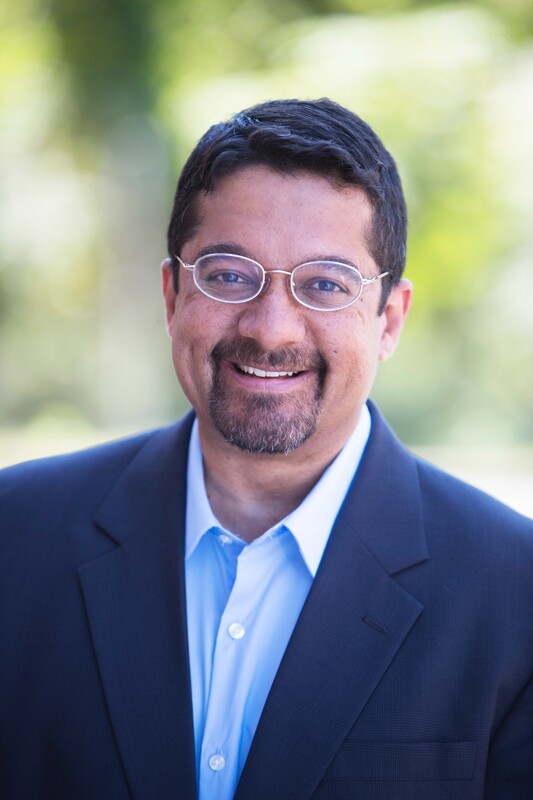 ACMP is honored to have NPR science correspondent Shankar Vedantam be our keynote speaker! Vedantam will share unique insights into how our unconscious biases, what he calls the hidden brain, and how it affects the decisions we make personally, as groups and organizations. He bases these findings on data, not on psychological theories of the subconscious. Vedantam is the host of the “Hidden Brain” Podcast, a former reporter with The Washington Post for more than 10 years and has lectured at Harvard University and Columbia University among many other accomplishments. The advanced rate ENDS tomorrow! Be sure to register today, and we’ll see you in the Nation’s capital October 5-6! Pre-Conference Workshops have been announced!